The anxiously awaited follow up to El Diablo Sin Corazon is finally here and it was most definitely worth the wait. 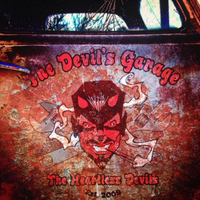 The Heartless Devils latest, a mini-album entitled The Devil’s Garage, is gritty, aggressive garage punk for a new age. With influences ranging from The Ramones and Cheap Trick to The Cramps and Lime Spiders, The Heartless Devils embody the term maximum rock ‘n’ roll. I’ve always dug garage/60’s Punk and so has Blaine. I’m always trying to sound like the Lime Spiders or The Sonics! These songs just kind of came together out of that and begged to be released separately from stuff we’ve written that is more like the natural continuation of El Diablo. From the immediate sonic blast of “Spell” to the opening bass line of “Mermaid”, Bittner & Co. give warning that the listener is in for a wild ride. Bittner’s incredibly expressive vocals make “Need You Bad” very convincing and a real winner. The same can be said for “Move Me” as Bittner’s vocals and the song’s main riff make for one monster hook. As enjoyable as these songs are, the band saved the best for last. From the sinister guitars to vocals soaked in sin, “Devil Devine” is easily as engaging as anything I’ve heard this year. To the good folks at Little Steven’s Underground Garage, take notice. “Devil Devine” is your next “coolest song in the world”. I tend to think you’re likely to see another EP later in the year that is a little closer in style to the album as well if all goes well. I’d like to kind of keep 2 threads of releases going – one more Garage oriented and one more Power Pop oriented. The Heartless Devils are Scott Bittner (vocals and guitar), Blaine Horn (bass and vocals) Cube (guitar and vocals) and James (drums).